Pumpkin Pie Granola | What Smells So Good? The pumpkin mania continues! I had way more leftover squash than Saturday's bars used, and since I've done a couple "stranger" granolas that won favour over the course of time, I figured I'd try my hand at a more "traditional" flavour scheme. I found this recipe from Pure Provender and fell in love with the photos of chunky, obviously crunchy clusters of oats. It looked like the perfect topping for my mom's favourite snack of Greek yogurt and apples! Around here, you can't really go wrong with pumpkin pie, but I wanted to add a bit of extra "oomph" to the basics and started playing around. To keep it nut free (and stick with the "pumpkin" theme), I tossed in some pumpkin seeds, then added an extra pop of colour from dried cranberries and some spelt flakes for interest. I amped up the pumpkin itself as well, just because I could. I was so pleased with the result! Chunky but not "brick like" clusters, the perfect balance of sweet and spicy, and filled with all sorts of goodness from the whole grains and pumpkin seeds - without a ton of oil! Mix the oats, spelt flakes, cinnamon, pumpkin pie spice, salt, brown sugar, pumpkin seeds and dried cranberries in a bowl. Add the pumpkin puree, oil, maple syrup and vanilla and stir well, until the oats are thoroughly coated. Spread out in a single layer on a greased baking sheet. Bake for 20 minutes, then stir and bake 30 minutes longer. Set the baking sheet on a rack until the oats are completely cool. 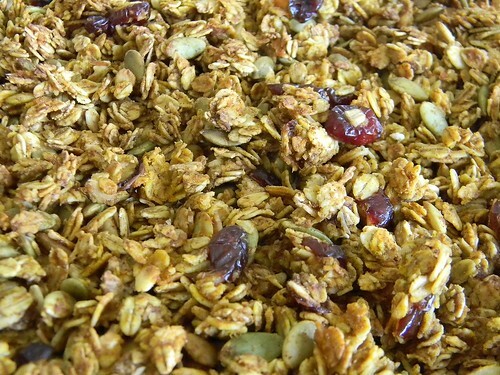 The oats will harden into granola while cooling.